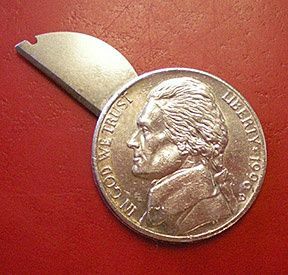 NEWS – How many times have you daydreamed about a knife hidden inside a nickel? Never? Me neither. But for those of you out there that have this dream, this post is for you. You can now own your very own nickel knife. It looks like a nickel and will probably spend like a nickel (not recommended). But hidden in the edge of the coin is a tiny flip out stainless steel razor blade. Practical? Doubtful. Useful? Again, doubtful. Conversation starter? Yes. If you want to buy one, it will cost way more than a nickel, but if you’re interested it’s priced at $39.99 on Amazon. Check out the video below that shows it in action. I bet a nickle I could get that through TSA ! I would not try, the penalty for knowingly to carry a razor blade through an airport is far too high and stupid to say the least! I’m sure it would show up on xray, if they are paying attention.